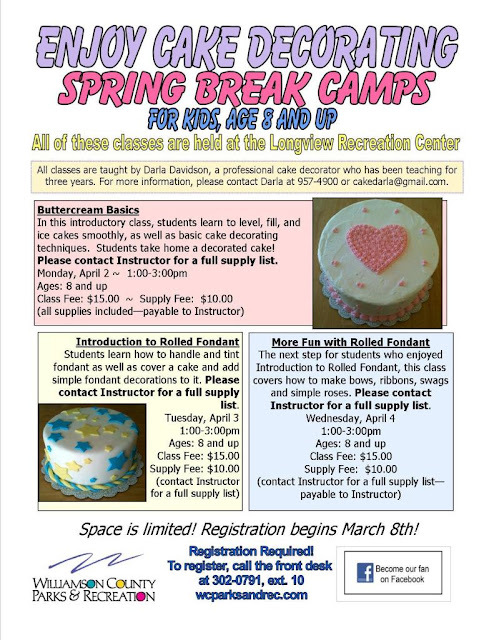 I'm offering the "Enjoy Cake Decorating" classes in a three-day camp series during Williamson County's Spring Break at the Longview Rec Center in Spring Hill. Students can register for just one class, two classes, or all three, depending on their interest. These classes are geared for ages 8 and up, and each class is $15 with a $10 supply fee. Monday April 2, 1:00-4:00 Buttercream Basics: The ideal class for anyone new to cake decorating. Students learn how to level, torte, fill, and ice cakes smooth, as well as simple piping techniques like stars and shells. 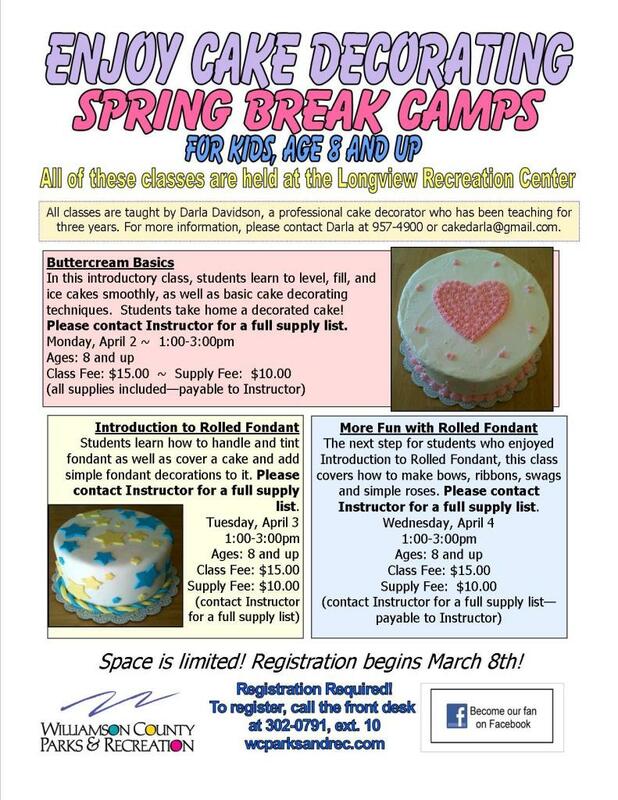 Students don't need to bring anything to Buttercream Basics, as all supplies are provided, including the cake layers. Tuesday April 3, 1:00-4:00 Introduction to Rolled Fondant: This class is for those with little to no experience working with rolled fondant icing. Students learn how to handle, tint, and shape fondant as well as how to cover a cake and add simple fondant decorations to it. Students need to bring in a cake that has been "crumb coated" with a light layer of icing--it does not need to look pretty because the icing is just there to make the rolled fondant stick to the cake. If they have a rolling pin and pizza cutter to bring, that's great, but if not I have extras they can use. Wednesday April 4, 1:00-4:00 More Fun With Rolled Fondant: For for those who enjoyed Introduction to Rolled Fondant or already have some experience working with rolled fondant and want to learn more. This class covers how to make bows, ribbons, swags, and simple leaves and flowers. Students need to bring in a cake that is iced (with the icing of their choice) and ready to decorate. They also need a rolling pin, and pizza cutter if they have them, if not I have spare tools for the students to use during class.